Glowing endorsements, testimonials and five-star reviews for "Rollercoaster: How a man can survive his partner's breast cancer" continue to be published each month. Below is a sampling of readers' kind words. Woody Weingarten, who remained steadfast at his wife's side through her battle with breast cancer, has written a memoir, an instructional guide, a journal of emotions, and more than anything, a love story. Anyone who has suffered through watching a loved one face possible mortality will find succor here. This book is a must-read for anyone affected directly or indirectly by breast cancer. The author not only immerses the reader in the devastating impact of the all too common affliction and its treatment on his wife, but also in the emotional rollercoaster of his experience and of the other male partners of cancer patients in his men's group, a not often presented narrative. His superb writing skills lead us along the path of initial discovery, diagnosis, therapeutic and reconstructive surgery, chemotherapy and irradiation to emotional and physical rehabilitation. He also supplies a thoughtful, well-documented and informative discussion of the various treatment options and the supports available to patients, partners and loved ones. As a physician involved for 40 years in both the medical and emotional aspects of cancer treatment, I give "Rollercoaster" my most enthusiastic recommendation. — Kenneth G. Lerner, M.D., psychiatrist, Veterans Administration Medical Center, Manchester, New Hampshire; staff physician, British Columbia Cancer Agency, Vancouver, B.C. Woody Weingarten is right. My wife's journey, our journey, after her breast cancer diagnosis has been like a rollercoaster — fear, uncertainty and disorientation. But our ride has been made immeasurably easier by him having placed himself — with his book in his own voice — in the seat right next to us. His teachings show us we can overcome our fears, retain our homes, and know our path has been illuminated by those who have faced similar challenges before us. His book is like a warm hand, reaching out to us, to our hearts, letting us know that we are not alone in our battle. Thank you, Woody, for your courage, strength and care, for telling us your story with the compassion and experience of a teacher, friend and survivor. Like a lot of men, my attitude toward life challenges has always been to address things head on and find a "fix." When my mother-in-law had aggressive cancer, my first stop was WebMD and Wikipedia, but ultimately neither of these gave any sort of real context or understanding of what my role could be. This book gives well-needed context and support for me dealing with these "unfixable" life challenges for the first time. This is a story that counts! If it were just the adventure of the romance between husband and wife that were meant to be, that would be enough. If it were just the personal story of the specifics of living through breast cancer, it would be enough. If it were just the information people need to know about options, it would be enough. And if it were just the advice man to man on how to see wives and partners through the miserable unasked for challenge of breast cancer, it would be enough. But, "Rollercoaster" is all of this and more. Here we have an offering of enormous generosity as we accompany Woody through a variety of intimate details he faced as he and his wife learned how to survive breast cancer. He talks about some of the things men and women, in the first numbing dread of diagnosis, do not think to ask. This book is a teaching on love, trust, patience, and the real meaning of "in sickness and in health." Although this book was written to advise men, there is no one who cannot learn how to be a powerful support to anyone going through the emotional and medical processes of breast cancer with its lessons on how to listen, to plan for a positive future even in the midst of a negative present. Truth be told, it is worth reading for the insights even if no one in your life has cancer because it is filled with very smart clues about how a man can be the best possible husband or partner. Thankfully our guide in this sadly familiar odyssey is an accomplished journalist. The reader is coaxed, buoyed, confounded, frightened, charmed and ultimately imbued with a sense of direction. Glance at any page at random and you will stumble on a helpful thought, a gem, even a tonic for the perplexed male caregiver. Woody Weingarten's "Rollercoaster" is an engaging and well-written reflective memoir of sharing his wife's battle with breast cancer. Relying on his memory and journals, his wife's journals, and extensive research, Weingarten tells a multi-faceted story, one that is deeply intimate at times and clinically savvy at others. His unique perspective on the male partner's response will be helpful to any man accompanying a partner through a journey with disease of any kind. This is a very readable book and thoroughly enjoyable for its raw honesty and appreciation of the absurdities of living with cancer. I found many striking similarities to my own book, "The Booby Blog: A Cancer Chronicle," which is a real-time narrative of cancer. We who struggle with disease — our own or our loved one's — share much in common, as "Rollercoaster" so clearly illustrates. Funny, smart, poignant, moving — and most of all, helpful. Woody Weingarten's book may focus on cancer, but it is a love story written by a superb writer. He writes charmingly with both wit and compassion. Every sentence is a creative use of words that merge into his story like butter on a delicious bun. If you only read one book about a couple going through the cancer process together, this is a must read. Weaving between the battle his wife fought against breast cancer and their deeply romantic relationship as her treatment evolved, Weingarten paints a profound and fascinating story. The couple's effort is meaningful to us all, and provides the reader with real ways through the challenges. The author's writing is bold, his message intense and educational. Although the thrust of "Rollercoaster" is unusual in that the focus is on the partner rather than the patient, it should be of immeasurable benefit to both partners in a relationship. Breast cancer is one of those scary, taboo subjects nobody wants to talk about, despite the fact that millions of people are and have been affected by it throughout the course of history. It's often considered a private matter, reserved for those going through it minus their loved ones and caregivers. It's personal. Cancer always seems to be so darned personal. Yes, cancer is personal, which is why this book is so important and necessary for all of us to read. 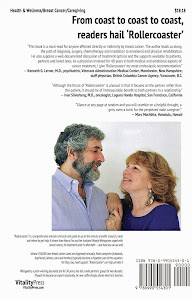 Weingarten is the caregiver of his wife and her breast cancer; years later, he is also the patient with cancer. Fantastic, sad, funny. A beautiful love story and a must read for those going through what he and his wife did. In fact, a must read for anyone who wants to read a book from the heart. I felt totally immersed in the words and feelings of this couple. Absolutely a joy to read. This book is written with humor, humanity and a great insight. It's way overdo and a must-read for all those who love someone experiencing the traumas of breast cancer. "Rollercoaster" is a comprehensive accounting of Woody Weingarten's journey fully acknowledging the agony of the experience but sharing it in a literary manner that makes me marvel at his writing ability. The book is, as he states, "a partial memoir-chronicle, partial love story and cumulative guide to hope," but the reader hears a story being told by a poetic narrator. Although Woody mainly expresses his journey on the cancer rollercoaster, the book is interlaced with the emotions and experiences of his wife, Nancy Fox, as well. I, who was one of Nancy's "chemo-sitters" and am a current breast cancer patient, appreciated the insertion of various statistics or results from studies to punctuate a particular point. In the end, the gift was not only that Nancy was cured of cancer, it was also the depth of their love for each other that supported them through their journeys, individually as well as together. Terrific book on a neglected subject, and a great read. I've finished reading "Rollercoaster" and was impressed, moved and inspired. 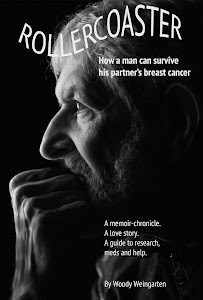 The book would be a gift for any male caregiver whose partner is dealing with breast cancer or any life-threatening disease. The author's relationship with his wife and the manner in which they dealt with her cancer are extraordinary, as is his ability to chronicle the experience. That's quite a parlay, and I think the result is a a love story than has a great deal to say, not only to male caregivers but to anyone, male or female, who is a partner in a significant, intimate relationship. I found Woody Weingarten's "Rollercoaster" surprisingly frank, eloquent, moving, and enlightening, from the first chapter — where the author ran into his teenage crush decades later — to the last chapter, where he shares his beautiful wedding vows. The vividness and exuberance of his prose illuminates even the darkest days he chronicles. In sharing his experience and that of other members in his Man to Man group, he offers an invaluable gift to spouses facing the same challenges, extending some of the fellowship and support of a group to those who may be feeling isolated and alone. And if a positive attitude is an aid to recovery, he's provided, by his own example, a powerful reason for others in a similar situation to hope. I wholeheartedly recommend "Rollercoaster." Terrific account of his and his wife's battles with cancer, and the way their loving relationship provided the strength and courage to overcome this disease. A very helpful, heartfelt story for anyone directly or indirectly affected by cancer. Woody Weingarten's book is a love story that can benefit thousands of other men. It is about conquering the travails of a loved one's fight against a dread disease. It is a story of life, not just for the cancer survivor but for the forgotten person in the struggle, the partner of the survivor. Woody Weingarten is an extremely articulate writer with an expansive perspective. His real-life experience as the partner of a woman who won the fight against breast cancer is an exceptionally helpful resource on both the medical and the emotional level. This book is hard-hitting and spot-on. The emotions are raw, but the love shines through. Any man whose wife is going through the dreaded experience of breast cancer must read this book. It puts things in perspective for all men. A must read!